What? I’m working on my obliques. Really. No Humans Allowed on Planet Dog? What began as a simple adventure last Thursday ended with enlightenment. Allow me to explain. Charlee had just returned home from an outing with her dad. Apparently, she found the outing rather disappointing because she immediately ran over to me and did her little dance, i.e., several 360-degree twirls, indicating she wanted something (or more accurately, wanted something more). Having only a few errands on my agenda, I asked Charlee, ”Do you want Mommy to take you on an adventure?” That obviously was the right question because she ran over to her chain and tapped it with her nose. So, off to The Home Depot (conveniently located next door to PETsMART) we went for a product return now four weeks procrastinated (two birds with one stone, n’est-ce pas?). Since our home renovations began back in July (yes, we are now in the fourth month after a brief hiatus during August), Charlee has become quite a celebrity at The Home Depot. 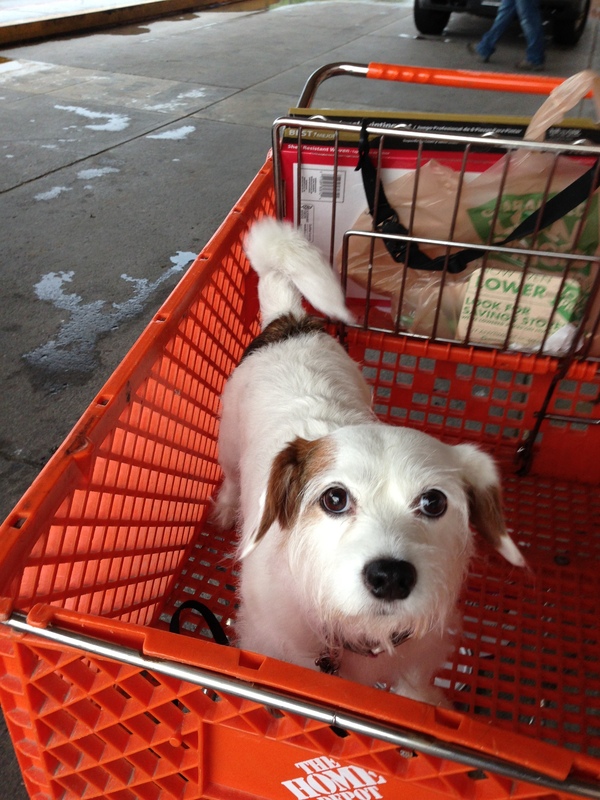 She likes their spacious orange carts because she can take a nap if the mission there hits a time-consuming snag. Anyway, the return clerk greeted her, petted her and gave her an Alpo Snap. Charlee thanked her with a generous head nuzzle. “Aw. Is Charlee a therapy dog?” the clerk asked. “Mine,” I replied promptly. “Saves me thousands,” I added. With that errand completed, we headed next door to PETsMART. This particular PETsMART is not Charlee’s favorite because it has a pet daycare and boarding facility, both of which concern her. (She has abandonment issues because I traveled extensively for work over a 10-year span.) Anyway, last Thursday, she wanted out of the store. Instead, Charlee headed right past Fry’s to the front door of Barnes & Noble, pulling me towards it with determination. “No, Charlee. No dogs allowed in Barnes & Noble,” I said. Charlee, usually one to behave immediately, was insistent that we go inside and sat down on the pavement in front of the door, staring up at me expectantly. “Charlee, no dogs allowed,” I repeated firmly, as she was blocking the door where patrons were gathering. “There’s a Starbuck’s inside,” I explained, knowing without a doubt she totally understood me and the rationale for her outdoor confinement. “Now let’s go.” She obeyed then, albeit reluctantly. No Humans Allowed on Planet Dog? Pshuh! 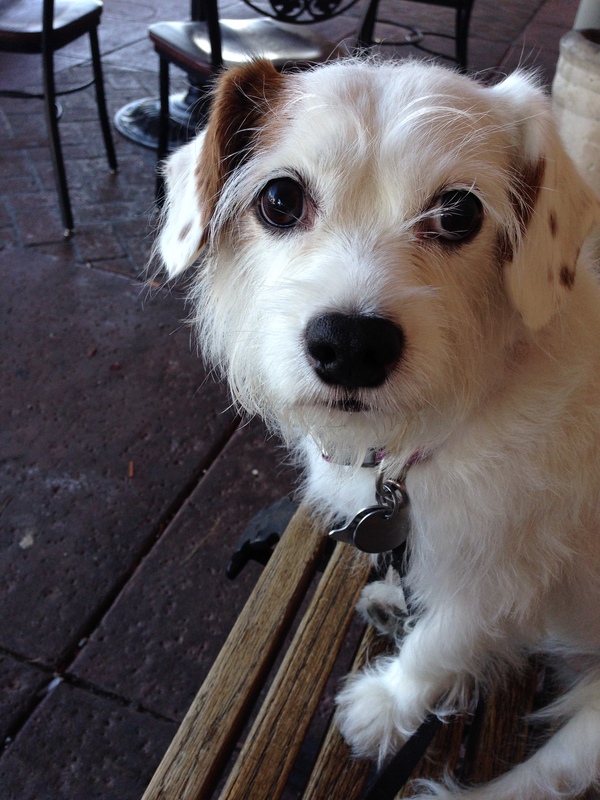 It can cost a fortune to walk your dog in Scottsdale, especially if you are a woman. No, I am not referring to therapy sessions or ER visits to cope with the javelinas, coyotes, bobcats, snakes, Gila monsters and scorpions. 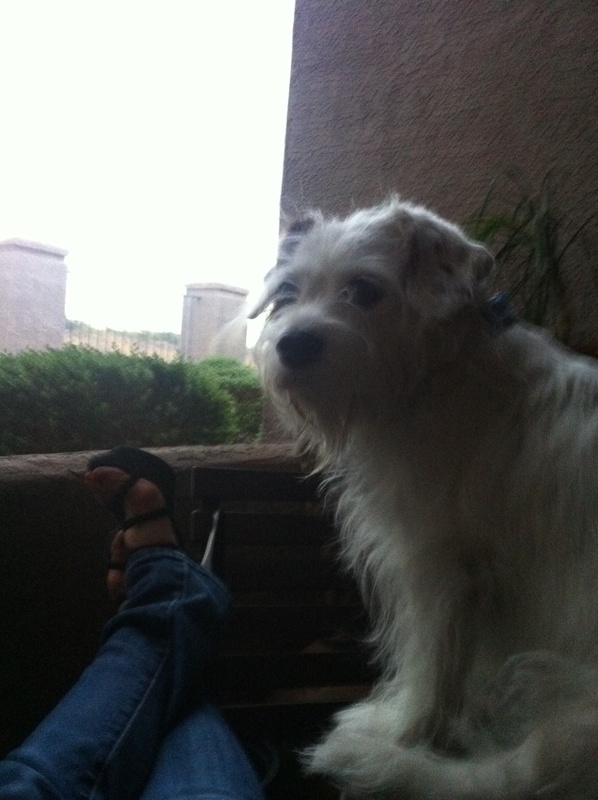 I am referring to the actual cost of walking your dog in Scottsdale, i.e., the desert version of Beverly Hills. Let’s start with your dog walking attire – a lululemon ensemble, of course, and it runs about $200 if you include the sports bra. Then, you need some MBT sports sandals in a variety of colors to complement your color scheme for the day. The most stylish ones run between $130-$200. And, you cannot spend that much money on your clothes if you are flabby. You will need a personal trainer several hours each week … another $200. Next, skincare is of utmost importance in the desert, especially when you are outside for 30-45 minutes several times each day. I use and recommend a variety of products. For sunscreen, I prefer the COOLA organic suncare collection. To moisturize the skin around my eyes, I love SkinMedica; for full face, I prefer Jan Marini. The “I-had-the-best-tan-of-anyone-in-the-world-during-my-teens-and-20s” sun damage repair is a work-in-progress with Obagi’s Nu-Derm System and Fraxel laser treatments at the helm. Estimated total cost for skincare: several thousands of dollars. Of course, you must keep your hair conditioned in this desert oven. My preferred hair care lines are Oribe and Moroccan Oil these days, but I am a fickle consumer. Cost? Conservatively, $300 for my favorite mists, creams and oils from each line. Bottom line: it’s cheaper to hire a dog walking service. Charlee & Mac: New Year’s Eve Playtime! Young journalists covering stories that matter.